The Vikings (8-5) will begin their quest for the playoffs as they return to TCF Bank Stadium for an NFC North collision with the Chicago Bears (5-8). Chicago might be eliminated from playoff contention, but they'll have plenty of motivation as they try to damper Minnesota's chances. Daniel House previews the game and provides his keys to victory. The Vikings (8-5) will begin their quest for the playoffs as they return to TCF Bank Stadium for an NFC North collision with the Chicago Bears (5-8). Chicago might be eliminated from playoff contention, but they'll have plenty of motivation as they try to damper Minnesota's chances. The Vikings had ten days to get healthy, but Harrison Smith and Anthony Barr will still be out. Nonetheless, Linval Joseph is listed as questionable and might return. After nearly knocking off a talented Cardinals squad last Thursday, the Vikings have built some confidence. They were a few plays away from having a chance against the second best team in the NFC. If they eliminate the turnovers, it's an entirely different ball game. 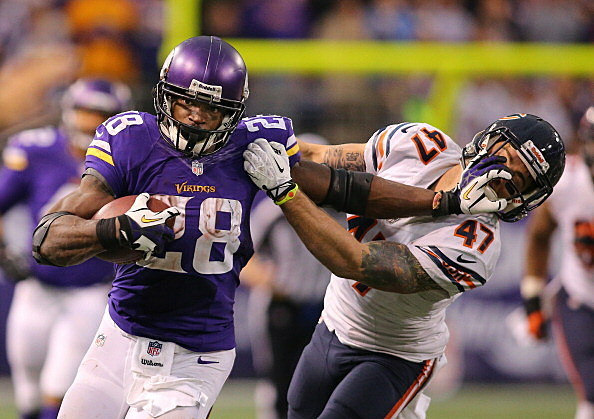 With that being said, the Vikings will need to be ready for a Bears team that has played hard this season. The vast majority of Chicago's losses have come by less than a touchdown. In fact, nine of their last ten games have been decided by one score. The Chicago offense has looked much improved under the direction of new offensive coordinator Adam Gase. Quarterback Jay Cutler is making better decisions with the football and wide receiver Alshon Jeffery continues to make big plays each week. Tight end Zach Miller is developing into a formidable threat at tight end and is starting after Martellus Bennett was placed on season-ending injured reserve. The Bears defense hasn't been leaky either. They've allowed 26 points or fewer in seven consecutive matchups. In addition, they've created at least one turnover in all but two of those games. If it wasn't for two losses on the foot of kicker Robbie Gould, we might be talking about a totally different scenario as we enter this matchup. Additionally, Minnesota needs to get back on track as they finish the season with two of their final three contests at home. They can clinch a playoff berth with some help from other teams, but winning this contest is the only way that can happen. Chicago is a feisty team and the Vikings need to be ready for that. We all know how effective Teddy Bridgewater can be when he has time to make throws. Last week, the offense really was tailored to his skill-set. Quick throws and roll-outs helped extend time for Teddy to find receivers up the field. For the most part, the offensive line held up well against Arizona. Toss out the final play of the game and we're talking totally different about this unit. In an earlier matchup with the Vikings, the Bears had just one sack. There were a countless amount of pressures, but the Bears never actually got to Bridgewater. Pernell McPhee is the best defensive lineman the Bears have on their squad. T.J. Clemmings will be getting help nearly every time McPhee is rushing on his side. However, with some quick passes and a simplified offense, the Vikings can attack this Bears defense. Centralizing McPhee will be the key to getting into a rhythm on offense. The Vikings have to get their passing game going by protecting well and calling plays that are best tailored to the skill-set of both the quarterback and wide receivers. The Vikings need to pound the football hard with Adrian Peterson. The Bears are ranked 26th in rushing yards allowed and teams are averaging 120+ rushing yards per game in three of the last four contests. Last week, Peterson rushed for his 100th career touchdown and accumulated 69 yards on the ground. He always specifically runs well against the Bears. He had 101 yards and a pair of scores against them in week eight. Chicago has allowed the second fewest passing yards per game this season. That means the Vikings will need to have a healthy blend of passing to set up rushing lanes. The Bears have a leaky run defense and Minnesota needs to take advantage of this with the best running back in the game. In the week eight matchup, Alshon Jeffery obliterated the Vikings' secondary. He had ten catches for 116 yards and a touchdown. In addition, he was targeted on 15 of the 33 total passing plays by the Bears offense. They'll need to have Xavier Rhodes shadow him like they have with other receivers like Julio Jones. It's also worth keeping an eye on tight end Zach Miller. Miller's role has increased since Martellus Bennett went on IR with a rib injury. He's added at least one touchdown in three of the last five games and he hauled in a season-high six targets last week. These two weapons are the main threats the Vikings defense will need to keep a close eye on. Jeffery is a big-bodied playmaker and Miller is excellent at getting open and accumulating yards after the catch. Anthony Barr and Harrison Smith will be out and the Vikings defense needs to tackle better. That was definitely a weakness in the Arizona game. The Cardinals picked up some unnecessary yardage because of poor tackling. That needs to get cleaned up as the Vikings can't allow Chicago to accumulate any big scoring plays. Of course, pressuring Jay Cutler is one of the main ways you can get him to make mistakes. The Chicago offensive line has allowed the fourth fewest sacks, so the Vikings defense will need to send pressure in a variety of ways. They only reached Cutler once in the week eight matchup and must do a better job of forcing him into mistakes. More importantly, Matt Forte and Jeremy Langford can't win this game on the ground. Both of them are dynamic running backs and cause havoc on the ground and through the air. Tackling well in space will be critical for the Vikings defense. They need to hold the Bears to under 100 yards rushing tomorrow. The Vikings defense plays significantly better when they can limit the opposing team's success in the ground game. The Vikings can't play from behind because they don't have the skill players to dig out of a big deficit. They need to set up the running game and control the time of possession. When they are forced to pass, they have to limit the amount of touches Adrian Peterson receives. They'll need him to touch the ball 20 times again this week. If the Vikings can get off to a strong start, they will be allowed to stick to their game plan. Chicago is a scary team when they can stay close. Nine of their last ten games have been decided by at least one score. That proves how important it will be for the Vikings to get ahead and put this one away. Winning these next two games at home will be pivotal for this team as they push towards the playoffs. They could clinch a playoff berth with some help and I've posted the potential scenarios from the NFL below.